In honor of the local Richmond community’s interest in bicycling and the UCI Road World Championship races that took place here in September, 2015, VMFA planned and opened ArtCycle. This highly participatory exhibit explores the theme of inspiration from bicycles as well as the art of the bicycle. Located in the Memorial Foundation for Children Teaching Gallery, visitors can discover how artists have been inspired by the bicycle and movement. The inspiration object from the collection is the Wassily Chair, by Marcel Breuer, which was inspired by a bicycle. The main section allows visitors to take a virtual tour on one of four stationary bikes through works in VMFA’s collection shown on video on a large screen. Other hands on sections include creating objects out of bike inspired parts like Spirographs, straws and connectors and tinkering with gears and chains. The exhibit also included a Beecycle mural by local artist Matt Lively. Another section encourages reflection on inspiration by asking “What Inspires you” and asking visitors to leave their comments on bike jersey shaped paper and hanging it in the space to share. ArtCycle was designed to be an exhibition that related to both national and local trends of biking, as well as continuing to serve our audiences who learn by doing, experimenting and creating. 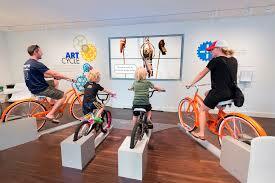 This highly participatory exhibition centers on cycling through VMFA’s encyclopedic collection. The exhibition allowed us to make a couple of key community partnerships and relationships with Virginia Commonwealth University and Richmond Cycling Corps (RCC). RCC is a local non-profit organization dedicated to bringing cycling to inner-city youth. The interactive nature of the exhibit also accommodated multiple styles of learning and encourage intergenerational collaboration. Four bicycles are mounted in front of a large screen. When visitors start peddling one of the bikes, the video begins. The six-minute video takes visitors on a virtual tour through the galleries as if they are riding a bike. Seven stops are made at works of art that related to movement. Pop ups, as well as voiceover, give fun facts about the art. The video plays on a loop and stops once the wheels on all the bicycles stop spinning. A message then appears “Start pedaling”. The video is powered by an original Processing sketch written by a professor at Virginia Commonwealth University, Peter Baldes, and student, Chelsea Clarke. Professor Baldes and Ms. Clarke created a communication system that linked the four bikes to an Arduino through the use of magnetic switches. The Processing sketch is open source and is available through VMFA’s Educational Resource Website. The entire video is also accessible from this website. The Richmond Cycling Corps students are featured at the beginning and end of the video. Four reproduction Wassily chairs are located in the exhibition. Text explains how the artist, Marcel Breuer, was inspired to design the chair based on the tubular steel forms of his Adler Bicycle. Visitors are encouraged to visit an authentic Wassily Chair in VMFA’s permanent collection. Four tables with various bike inspired projects encourage visitors to create and tinker with different materials: 1) Spirograph drawings, mimicking the shape and rotation of various bike parts 2) straws and connectors to mimic tubular steel of bikes 3) plastic gears and chains similar to bicycle parts are available for tinkering 4) small paper shaped like bike jerseys encourage participants to design their own jersey using pens/pencils/stencils. Jerseys can then be hung on the wall, or taken. Bike jersey shape on wall with small hooks for people to hang small bike jersey shaped paper. People are prompted to tell us what inspires them, and can leave thoughts on paper jersey. A large mural by artist Matt Lively of Beecycles and incorporates the theme of inspiration from bicycles. 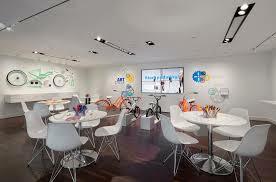 The space, with seating, also encourages will rest and images to be taken and shared #VMFAartcycle. A brochure encouraging visitors to sketch objects in VMFA’s collection that inspire them are distributed in the gallery. At various stops of the visitors choosing, sketching prompts are given. A teacher resource on exhibition development, including STEAM elements, was created in relation to this exhibition and piloted at a Teacher Workshop in February. Based on the feedback received, workshops on processing and Arduino for art teachers have been planned. Components of this exhibition will continue to live on past the end date of June 30th, 2016.